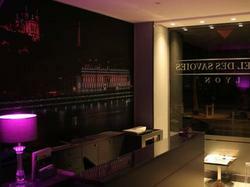 Hotel des Savoies provides en suite rooms with satellite TV in the Presqu'ile district of Lyon. Free Wi-Fi and on-site private parking are available. Each Savoies room is air-conditioned and has a work desk. The rooms are accessible by lift. Hotel des Savoies is on the peninsula between the Rhône and the Saône rivers, across from Vieux Lyon. It is conveniently located just 600 metres from the Perrache Railway and Metro Stations (line A). There are many restaurants in the area. Reception is open 24 hours a day for guests' convenience. Follow Lyon Centre, place Bellecour. The Rue de la Charité is a one way road and starts from place Bellecour. Breakfast is served from 06:30 until 12:00. This family room has air conditioning, electric kettle and sofa. This double room features a minibar and air conditioning. Rooms can be set up with twin beds upon request. This single room has air conditioning and minibar.